Cooper Bussmann is a manufacturer of Bussmann fuses and fusible protection systems. Bussmann fuses include the most extensive circuit protection solutions for use in a variety of major standards: UL, CSA, and IEC as well as European, DIN, and British Standards. North American styled Bussmann fuses are used in a wide range of applications: industrial motor protection, power conversion, medium voltage, power distribution, telecommunications, electronics, and automotive. Bussman series low-peak fuses offer superior current limitation to help increase short-circuit current ratings. A major innovation by Bussmann fuse is the Bussmann CUBEfuse. 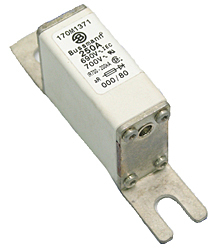 The Bussmann CUBEfuse footprint is the smallest of any power fuse class on the market. Its rectangular construction allows for minimum space in the control panel while providing a high finger-safe rating and enhanced workplace safety. Selective coordination ratio of 2:1 (within low-peak fuse family) prevents electrical shutdowns from extending beyond the failed circuit. A 3-pole 100 amp Bussmann Cubefuse holder occupies one-third the space of the normal 100 amp Class J block. The Bussmann Cubefuse is available in 30-60amp, 600V and the newly released 70-100 amp. For additional information about our manufacturers, please contact us to get in touch with our customer service team.